Why is it flooding now in St. Paul? Spring is the time for floods. Rain plus melting snow pushes rivers over their banks. So why is the Mississippi flooding in St. Paul in the Fall? It all has to do with a large weather event a week ago. I put together this animation of the radar images from the storm. It is important to appreciate the time scale of this animation. Storms usually pass by quickly. This loop is comprised of 31 images, each one hour apart. 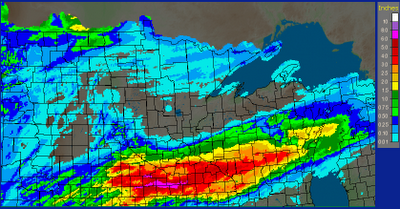 This storm sat on southern Minnesota for over 31 hours dumping rain. All told, some places received nearly a foot of rain. That amount is hard to comprehend. This map is a Precipitation analysis from the Advanced Hydrologic Prediction Center. It shows total rainfall for the event. The purple area is over six inches, red is five inches, orange is four inches. Consider what that means. The entire southern part of the state was covered by at least four inches of water. It all has to go somewhere and that somewhere is the Minnesota River. I tried to calculate a rough idea of how many gallons that is and I ran out of zeros. It was on the order of millions of millions. Looking at a map of the river basins of Minnesota you can see why St. Paul is about to flood. The rains dumped mostly in the Minnesota River Basin but elsewhere as well. The Minnesota river is currently carrying a heavy load of water. As it moves downstream it meets up with the Mississippi and the two continue on to St. Paul. The crest at St. Paul is expected to be at or slightly above the flood levels we saw this past spring. It will be somewhere around 18 feet. I know my fossil hunting program I had scheduled to teach today at Lilydale Regional Park was canceled by the city as they are closing the park. Harriet Island is closed and they are putting up flood walls at the St. Paul airport. Warner road along the river is also closed. A lot of people have been coming here looking for a link to the webcam at the Science Museum that showed the rising river last spring. I talked to folks downtown and unfortunately the camera is out of commission. A new one has been ordered, unfortunately it will arrive after the crest of the river. Heh, for some reason the computer made the url of this story read like there was a 135 inch rainstorm. Can you imagine!